Megan Rapinoe scored the game’s only goal as Seattle Reign FC topped Utah Royals FC 1-0 at UW Medicine Pitch at Memorial Stadium. The win moves the Reign to 8-3-5 on the season with 29 points, good enough for second place in the NWSL — and with a game in hand, they have a bit of cushion between their nearest competitors. The Reign are also now 5-1-2 at home, the second-best home record in the league and are riding a three game winning streak. The loss for Utah drops them to 5-5-6 with 21 points, and they remain in sixth place — now four points out of the final playoff spot with a third of the season remaining. It’s their second straight loss and they are now 1-3-1 in their last five games since their upset of the North Carolina Courage. Rapinoe’s goal came in the 54th minute, a header on a Steph Catley corner kick. Catley’s service floated past the back post and Rapinoe headed it back across and to the side netting of the near post to beat Utah goalkeeper Abby Smith. It’s Rapinoe’s seventh goal of the season, tied for second in the NWSL. In the 30th minute, Reign defender Theresa Nielsen made a run down the right sideline to steal a backpass and then serve a cross into the box. Rapinoe’s shot was well-blocked by Utah’s Katie Bowen to prevent a shot on net. Utah Royals FC forward Amy Rodriguez had a chance to get her side on the board in the 47th minute, but her effort hit side netting. The Reign controlled possession in the first half, but Utah had the better of the second half and the match ended at a near-even split between the two teams. Four players received yellow cards in the match: Seattle’s Allie Long and Utah’s Gunnhildur Jónsdóttir, Rachel Corsie and Sam Johnson. Johnson’s yellow card gives her five for the season, and she will have to sit out Utah’s next match on Saturday vs. Orlando. Utah Royals FC were without Diana Matheson, who was serving a one-game suspension for a late challenge on Thorns defender Midge Purce last weekend. They were also without Becky Sauerbrunn, who was ruled out on Wednesday afternoon with a left tibial stress reaction. Desiree Scott wore the captain’s armband for Utah on the evening. Seattle Reign FC midfielder Jess Fishlock started and played all 90 minutes in her first appearance since June 3 after missing time to do a right quad strain. Forward Adriana Leon made her first start for the Reign after joining them in a trade last month. The game marked the second meeting of the season between the two teams — but Utah Royals FC head coach Laura Harvey’s first game in Seattle as the opposing coach. Harvey spent the last five seasons with the Reign before stepping down and then later joining the new Utah franchise as their first head coach. Both teams will be back in action on Saturday night. Utah Royals FC will host the Orlando Pride and Seattle Reign FC will visit the Chicago Red Stars. Match ends, Seattle Reign 1, Utah Royals 0. Second Half ends, Seattle Reign 1, Utah Royals 0. Attempt blocked. Jasmyne Spencer (Seattle Reign) right footed shot from the left side of the box is blocked. Attempt blocked. Megan Rapinoe (Seattle Reign) left footed shot from the centre of the box is blocked. Assisted by Jasmyne Spencer. Substitution, Utah Royals. Erika Tymrak replaces Rebecca Moros. Attempt blocked. Samantha Johnson (Utah Royals) right footed shot from the centre of the box is blocked. Assisted by Katie Bowen. Attempt missed. Katie Bowen (Utah Royals) right footed shot from outside the box misses to the left. Assisted by Rebecca Moros. Substitution, Seattle Reign. Alyssa Kleiner replaces Jodie Taylor. Attempt missed. Jasmyne Spencer (Seattle Reign) header from the centre of the box is close, but misses to the right. Assisted by Theresa Nielsen with a cross. Substitution, Utah Royals. Katrina-Lee Gorry replaces Lo'eau LaBonta. 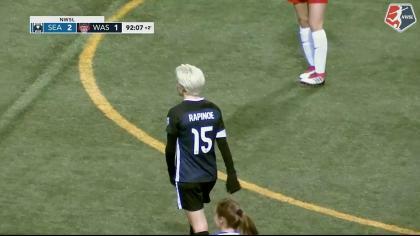 Megan Rapinoe (Seattle Reign) hits the bar with a right footed shot from the left side of the box. Katie Stengel (Utah Royals) wins a free kick in the defensive half. Hand ball by Katie Stengel (Utah Royals). Delay in match Jessica Fishlock (Seattle Reign) because of an injury. Corner, Seattle Reign. Conceded by Rachel Corsie. Attempt blocked. Gunnhildur Yrsa Jonsdottir (Utah Royals) right footed shot from outside the box is blocked. Assisted by Lo'eau LaBonta. Offside, Seattle Reign. Jasmyne Spencer tries a through ball, but Jodie Taylor is caught offside. Gunnhildur Yrsa Jonsdottir (Utah Royals) is shown the yellow card for a bad foul. Substitution, Seattle Reign. Jasmyne Spencer replaces Adriana Leon. Attempt missed. Gunnhildur Yrsa Jonsdottir (Utah Royals) right footed shot from outside the box is just a bit too high. Assisted by Christen Press. Attempt missed. Rebecca Moros (Utah Royals) right footed shot from outside the box is too high following a corner. Corner, Utah Royals. Conceded by Theresa Nielsen. Corner, Utah Royals. Conceded by Allie Long. Goal! Seattle Reign 1, Utah Royals 0. Megan Rapinoe (Seattle Reign) header from the left side of the six yard box to the top right corner. Assisted by Stephanie Catley with a cross following a corner. Corner, Seattle Reign. Conceded by Gunnhildur Yrsa Jonsdottir. Attempt missed. Christen Press (Utah Royals) header from the centre of the box misses to the right. Assisted by Gunnhildur Yrsa Jonsdottir with a cross. Attempt missed. Amy Rodriguez (Utah Royals) right footed shot from a difficult angle on the right is close, but misses to the right. Second Half begins Seattle Reign 0, Utah Royals 0. First Half ends, Seattle Reign 0, Utah Royals 0. Allie Long (Seattle Reign) is shown the yellow card for a bad foul. Attempt blocked. Megan Rapinoe (Seattle Reign) header from the left side of the six yard box is blocked. Assisted by Jodie Taylor. Adriana Leon (Seattle Reign) wins a free kick in the attacking half. Offside, Seattle Reign. Beverly Yanez tries a through ball, but Megan Rapinoe is caught offside. Attempt blocked. Katie Stengel (Utah Royals) header from the centre of the box is blocked. Assisted by Katie Bowen. Hand ball by Megan Rapinoe (Seattle Reign). Attempt missed. Beverly Yanez (Seattle Reign) left footed shot from outside the box is close, but misses to the right. Delay in match Beverly Yanez (Seattle Reign) because of an injury. Jodie Taylor (Seattle Reign) wins a free kick on the left wing. Attempt blocked. Megan Rapinoe (Seattle Reign) right footed shot from the centre of the box is blocked. Assisted by Theresa Nielsen with a cross. Attempt blocked. Desiree Scott (Utah Royals) right footed shot from outside the box is blocked. Offside, Seattle Reign. Adriana Leon tries a through ball, but Beverly Yanez is caught offside. Attempt missed. Megan Rapinoe (Seattle Reign) right footed shot from outside the box is just a bit too high from a direct free kick. Attempt missed. Amy Rodriguez (Utah Royals) left footed shot from the left side of the six yard box is close, but misses to the left. Attempt missed. Christen Press (Utah Royals) right footed shot from outside the box is too high. Attempt missed. 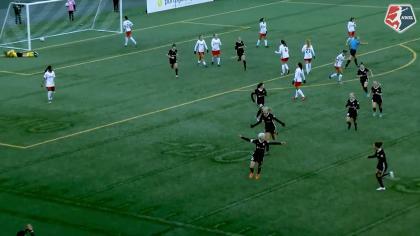 Adriana Leon (Seattle Reign) left footed shot from outside the box is too high. Assisted by Beverly Yanez. Hand ball by Allie Long (Seattle Reign).